Flossing your teeth is essential to good oral health, as any dental hygienist or family dentist in Lexington, SC will surely tell you. Removing plaque from your teeth will benefit you in preserving the health of your teeth and gums, as well as defend yourself against potential tooth decay. Despite the warning, many people may floss diligently for only a short time after a dental appointment, and then resume their bad habits of skipping flossing. The American Dental Association (ADA) recommends brushing twice and flossing once daily. It can’t be emphasized enough that keeping your gums and your teeth healthy requires regular flossing. A proper oral hygiene program requires you to floss your teeth before or after you brush your teeth. Why should you floss your teeth? The primary reason for flossing is to eliminate the bacteria that builds up between your teeth and in the areas where your gum tissue meets your teeth. Brushing your teeth alone is not sufficient for getting rid of all of this harmful bacteria, though flossing correctly does go a long way toward eliminating the accumulated bacteria and promoting good dental hygiene. This may also help with chronic bad breath, also known as halitosis. Should you use a flossing threader? If you have difficulty using regular dental floss then you may wish to use a flossing threader which has a loop at one end for threading the dental floss. Although it is quite easy, your dental hygienist or family dentist in Lexington, SC can show you the proper way to use a flossing threader – use a piece of dental floss about 14 to 18 inches long and put one end of it through the loop so that one side of the floss is about twice as long as the other. What is the proper way to floss the teeth? When you insert the dental floss between your teeth make sure to contact all of the surface area of the teeth. A good rule of thumb is to begin at the back teeth (the molars) and work toward the front, making two to four passes in each space between your teeth. 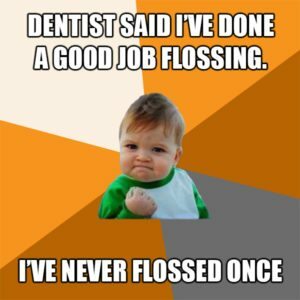 When you are done flossing one side, begin again in the back on the other side, working toward the front teeth. When you are done make sure to rinse out your mouth. Your family dentist in Lexington, SC will advise you to use dental care techniques that feel natural and comfortable. Here are the two most common flossing techniques. To use the spool method, simply pull off about 18 inches of floss and wind most of it lightly around your middle finger. Don’t pull tightly and cut off your circulation. Then wind the remaining floss around your other hand’s middle finger to take up the used floss as you go. Now, push the floss in between your teeth using your index fingers and thumbs. Gently bring the floss up and down several times around both sides of each tooth, making sure to reach below the gum line, forming a C around each tooth with the floss. Pull or push it against your gums carefully so that you don’t hurt them; avoid rubbing it from side to side. If you’re not especially skilled with your hands, or if you have to floss someone else’s teeth for them, you may want to consider a pre-threaded flossing tool. These small plastic devices come in bulk packages at drugstores. They are inexpensive but very effective. Ask your family dentist in Lexington, SC for some samples. Use these flossing tips and techniques to improve your dental hygiene and prevent tooth decay. Flossing properly removes bacteria that can cause cavities and will help you preserve good oral hygiene. Take care of your teeth and gums and make sure to continue regular check-ups and teeth cleanings with your family dentist in Lexington, SC. Please contact us at Smith & Robinson, DMD to consult with you about your dental needs.